So… broccoli and cauliflower… you a fan? Even if you personally are, chances are you know someone close to you who really isn’t. Like your kids, perhaps. Or your s.o. 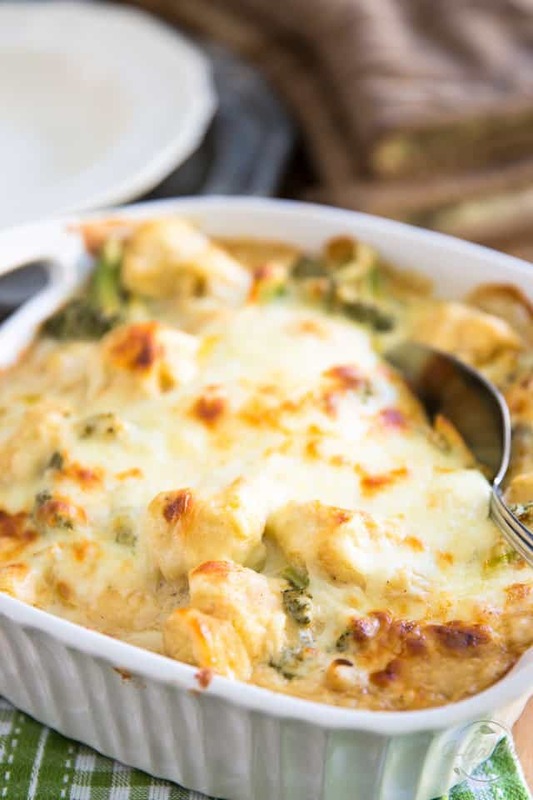 And you’re probably trying to get them to eat more of it, quite possibly by attempting to hide the “nasty veggies” under mounds and mounds of butter and cheese. 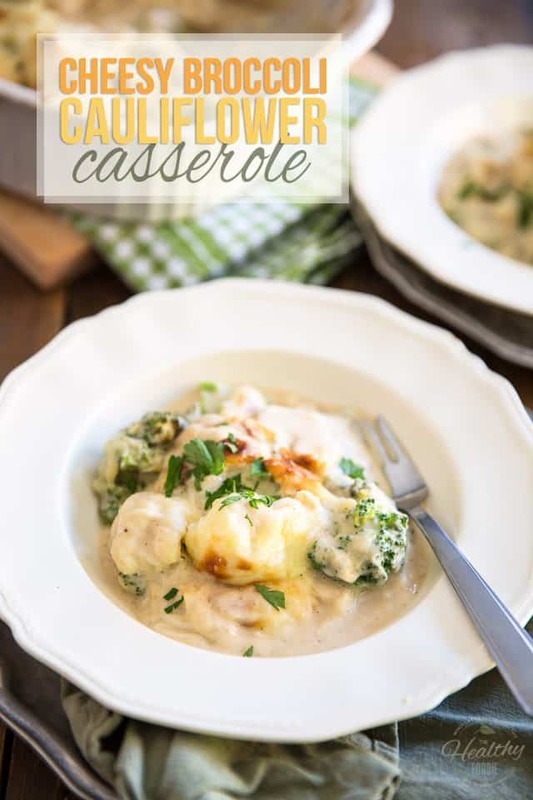 Well, this healthier Cheesy Broccoli Cauliflower Casserole right here is a delicious way to sneak more cauliflower and broccoli into any non-fan’s diets without overloading the whole dish with so much unnecessary cheese. 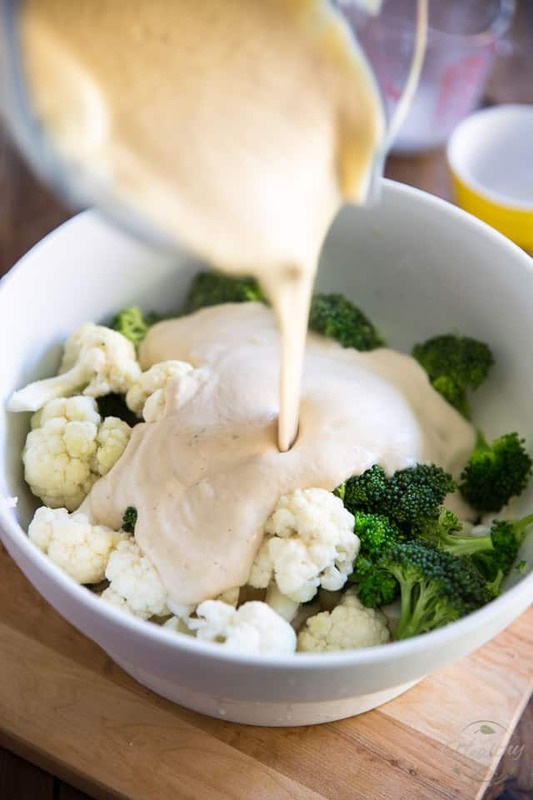 In fact, the lusciously creamy sauce that you’re looking at is made primarily from super nutritious bone broth and… cauliflower! We’re talking cauliflower drenched in more cauliflower. How bad can it be? Okay, okay, there happens to be a little bit of cheese in that sauce too, for added flavor you know. And then there’s as a little bit more on top to have you believe that the entire dish is actually LOADED with the stuff. 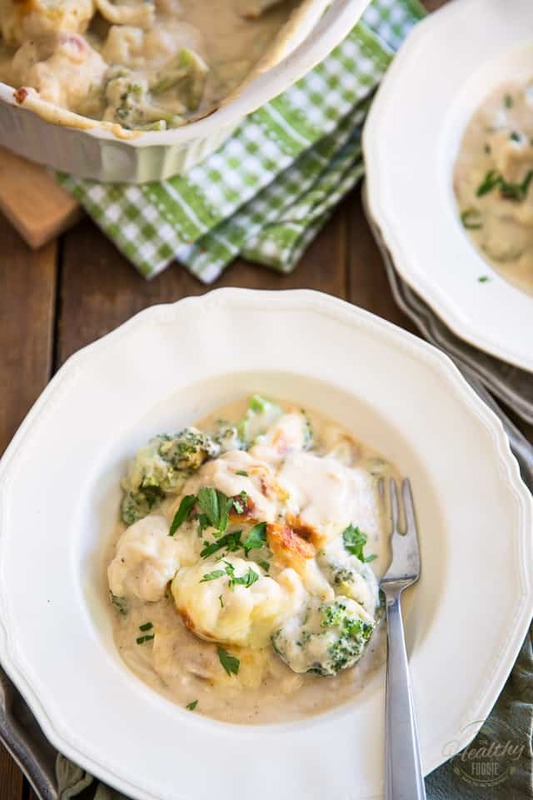 I think one of the most crucial steps for this recipe to be a success is that you need to blanch the cauliflower and broccoli before to throw them in the oven. Not cook all the way through!! Blanch! To do that, bring plenty of salted water to the boil in a large stockpot. 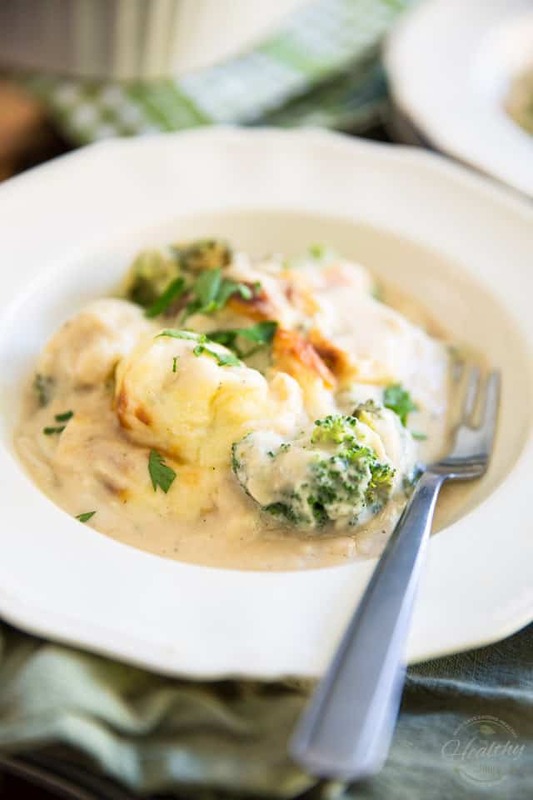 Once the water has reached a rolling boil, add 4 cups of cauliflower florets to the pot; cover and let the cauliflower cook for 2 minutes, then add the broccoli and continue cooking for a further 2 minutes. You want to add the broccoli a little later in the game because it doesn’t take quite as long to cook. If you were to add both vegetables to the pot at the same time, your broccoli would be way overcooked! 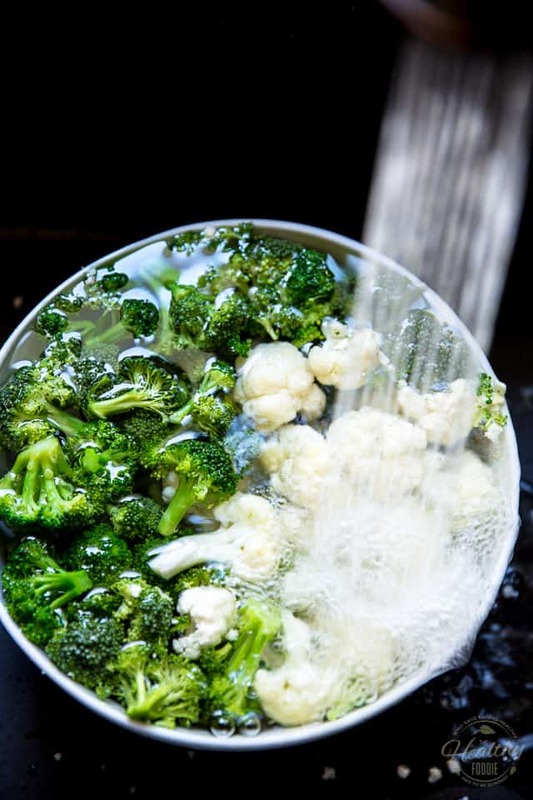 Then comes an even more crucial step: you’ll want to promptly drain the cauliflower and broccoli and place them in a large bowl, then run plenty of cold water over them until the water in the bowl remains cold and the vegetables feel cold to the touch. 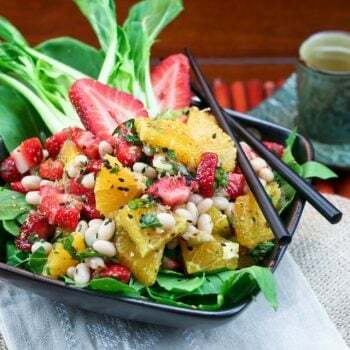 This additional precaution will halt the cooking process and also seal in the lovely flavors and vibrant colors of the vegetables. If you didn’t do it, your broccoli would in all likelihood turn a yucky shade of brown and both vegetables would take on a strong and rather unpleasant sulfurous taste. Yuck! Trust me, you don’t want that. Once the veggies are completely cool, drain them well and set them aside. Next, we need to work on the creamy, cheesy sauce. But first, preheat your oven to 350°F. Then, melt about a tablespoon of fat in a medium saucepan set over medium heat; I used the fat that I collected from the top of my bone broth, but feel free to use whatever kind of fat you prefer. Add the onion, salt and pepper and cook until the onion starts to color and become fragrant, about 3 minutes. Then, add the remaining 4 cups of cauliflower florets and continue cooking for 2 minutes, then pour in the bone broth and bring it to the boil. Lower the heat, cover and simmer until the cauliflower is super tender and even slightly overcooked, about 8 to 10 minutes. 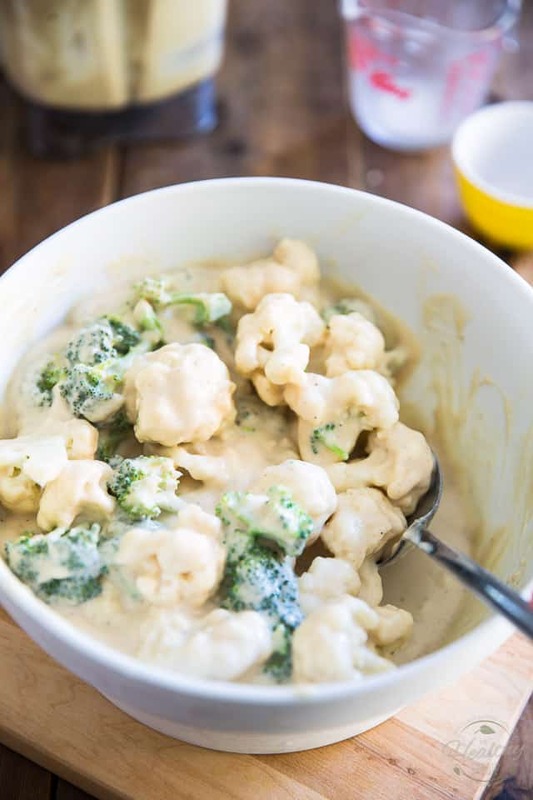 We want that cauliflower to be really mushy, since we’ll be turning it into a creamy sauce! Very carefully pour the overcooked cauliflower mixture into the container of your high-speed blender then add the milk, Dijon mustard, grated sharp cheddar and Parmesan cheese. Process on high speed until smooth and creamy and pour over the reserved cauliflower and broccoli. 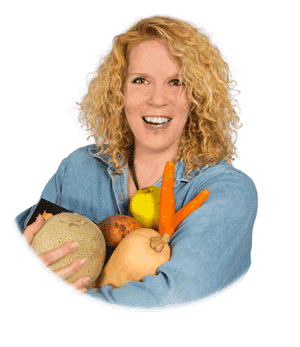 Make sure that your blanched veggies have been drained really, really well. 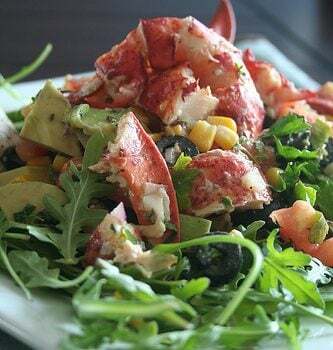 The last thing you want at this point is to be introducing all kinds of excess water to the dish — it would only end up diluting the beautiful sauce that you just made. Toss until the veggies are evenly and generously coated. Transfer to a 9″ baking dish and then top with the grated mozzarella and remaining grated sharp cheddar cheese. Bake uncovered for 30-35 minutes or until the cheese on top is golden and the sauce bubbles on the sides. 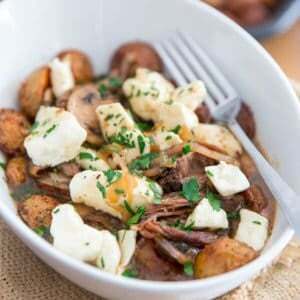 Give your casserole a little bit of resting time, about 5 to 10 minutes, before serving to your hungry guests of family members. In a large stockpot, bring plenty of salted water to the boil. 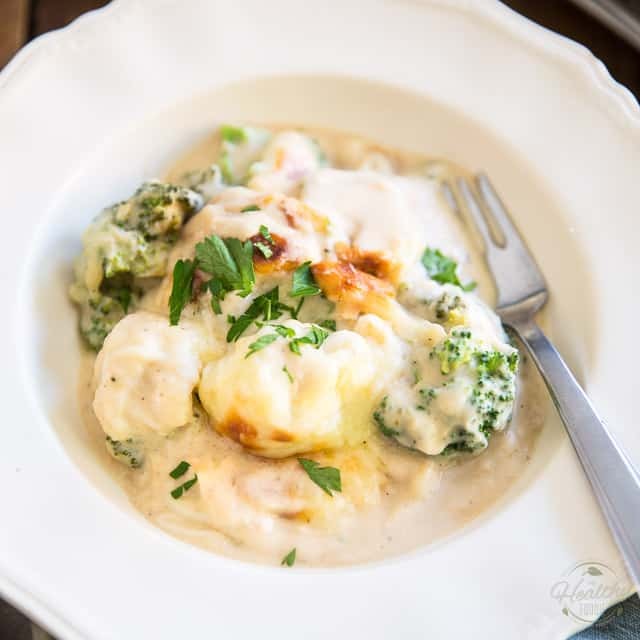 Once the water has reached a rolling boil, add 4 cups of cauliflower florets to the pot; cover and let the cauliflower cook for 2 minutes, then add the broccoli and continue cooking for a further 2 minutes. Promplty drain the cauliflower and broccoli and place them in a large bowl; run some cold water over them until the water in the bowl remains cold and the vegetables feel cold to the touch. 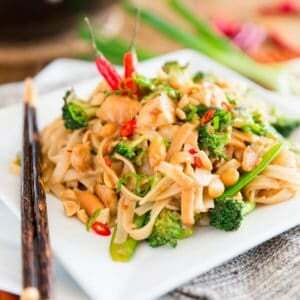 This will halt the cooking process and also seal in the flavor and color of the vegetables. Drain well and set aside. 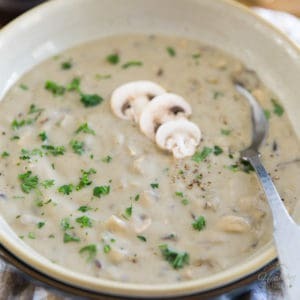 Preheat your oven to 350°F; Melt the fat in a medium saucepan set over medium heat; add the onion, salt and pepper and cook until the onion starts to color and become fragrant, about 3 minutes. 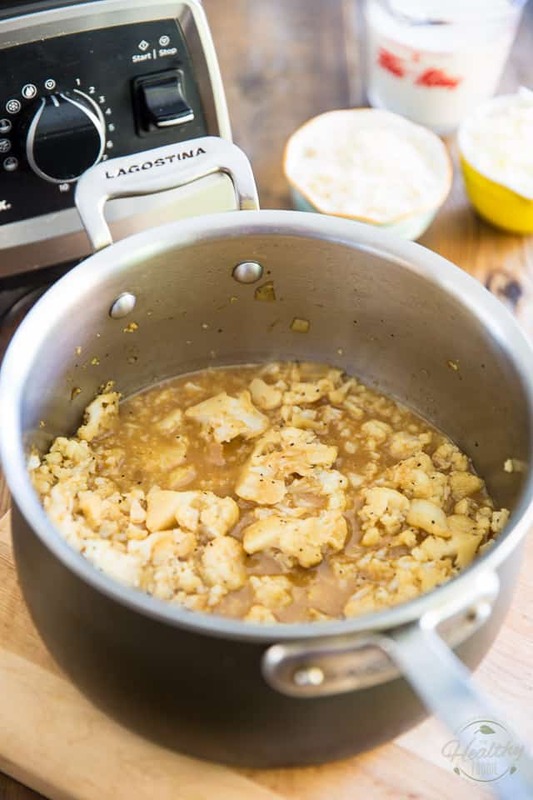 Add the remaining 4 cups of cauliflower florets and continue cooking for 2 minutes, then pour in the bone broth and bring it to the boil; lower the heat, cover and simmer until the cauliflower is super tender and even slightly overcooked, about 8 to 10 minutes. 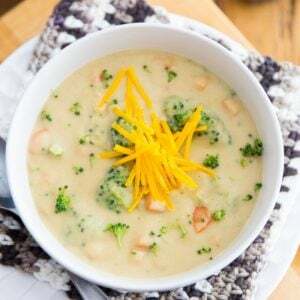 Carefully pour this mixture into the container of your high-speed blender; add milk, Dijon mustard, grated sharp cheddar and parmesan cheese and process until smooth and creamy. 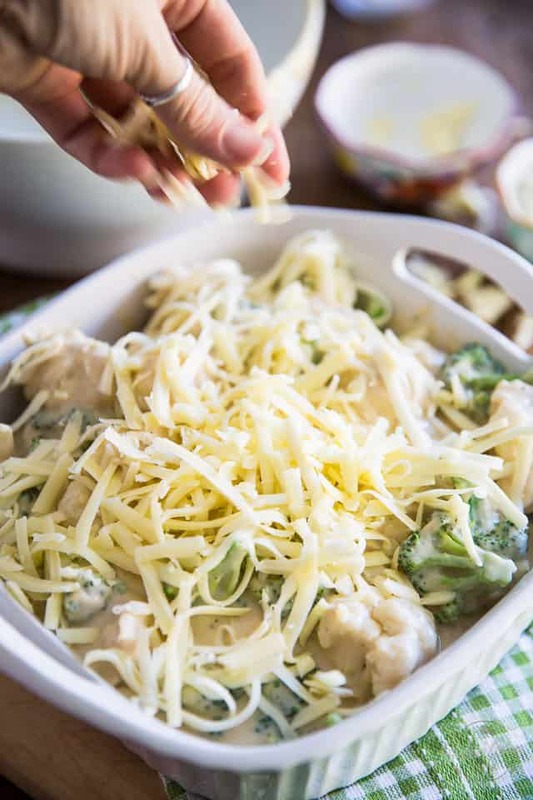 Pour this sauce over the blanched cauliflower and broccoli and toss to coat; transfer to a 9" baking dish, top with grated mozzarella and remaining grated sharp cheddar cheese. Bake for 30-35 minutes or until the cheese on top is golden and sauce bubbles on the sides. This looks delicious. I would not have thought to add the cauliflower and broccoli together. HA!! I do in salads. Has anyone tried adding chicken to this to make it a main entree? Also, what is a substitution for bone broth? Chicken broth? Of course, adding chicken would be a brilliant idea! And chicken broth would totally work as a replacement for the bone broth, especially if you were going to add chicken to the dish! 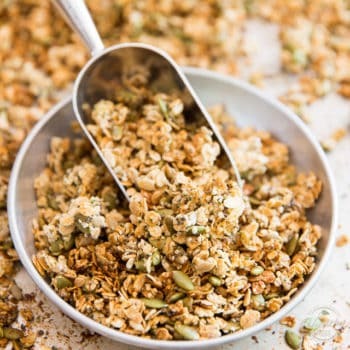 This recipe looks like just what we need to satisfy some cravings while doing the 21 day sugar detox. 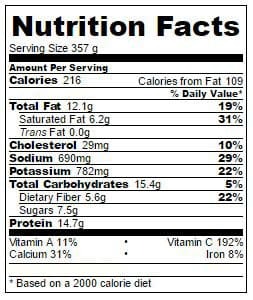 I was curious though, it sounds like the recipe calls for 8 cups of cauliflower, not 4. Confirm 4 cups of cauliflower goes into making the sauce and the other 4 cups goes in the casserole as florets? Thanks so much, can’t wait to try it. That is correct Jessica. 4 cups go into the sauce and 4 cups go into the casserole as florets. Wondering if I can do most of this 24 hours ahead and then bake in time for dinner? I really wouldn’t see why not, Wendy, only you might have to leave it in the oven for a bit longer, to account for the fact that it’ll start baking from cold.